A slightly sweet, tender fruit covered with a shiny skin that ranges in color from purple, which is the most familiar, to red, yellow, green, or white, depending on the variety. Since this fruit is a member of the nightshade family, which includes the potato and tomato, it is classified as a fruit. The African eggplant is similar to the Thai eggplant in size and shape. 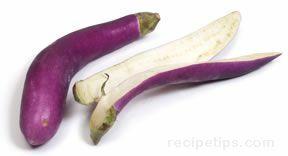 Small in size, the eggplant may be smooth and round or evenly shaped with indented and rounded sections, similar to miniature pumpkins. This variety of eggplant is generally bitter, and is often served in soups and stews, complimenting the flavors of other ingredients. 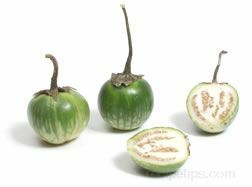 The African eggplant may also be known as Garden Eggs, Mock Tomato, ngogwe, or nyanya chungu. An eggplant requires a long, warm growing season, so it is most plentiful in late summer to fall. Eggplant is excellent when stuffed with a variety of ingredients, sautéed, broiled, baked, grilled, or slowly cooked in meat, rice, or cheese dishes and stews. Eggplant can also be substituted for pasta in lasagna dishes. When selecting this fruit, choose those that have a shiny tight skin, making sure they are not dull colored or lightweight with rust spots. 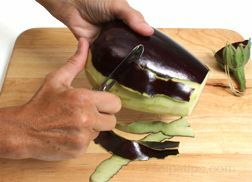 For the best flavor, refrigerate eggplant unwashed in a plastic bag for no more than a week. 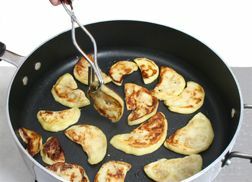 An eggplant may also be referred to as aubergine (French), berenjena, brinjal, Guinea squash, garden egg (bitter ball or bitterball), melongene, or melanzane.